CLAT Result 2018 : Chanakya National Law University, Pune (CLNU), has conducted the Common Law Admission Test (CLAT) examination on 13th May across India. Candidates seeking admission into national level law colleges have attempted the examination. Candidates seeking admission in LLB and LLM courses have attempted the examination. Students qualifying the examination with good merit will get admission in National Law colleges. The competition is high for CLAT examination this year. All the competitors attempted the CLAT examination are eagerly waiting for the CLAT result 2018. The CLNU is going to declare the CLAT result on 31st may on its official portal, clat.ac.in. Aspirants can download the result, and check their rank and score in the examination. The CLNU annually conducts the CLAT examination for a huge number of candidates to provide admission into Graduate/Post-Graduate Law courses in National Law Universities in India. In India, there are 16 National Law Universities were there in which there are 2,204 seats for UG Courses and 514 seats for PG courses are available. For these few seats, huge number of aspirants competes annually. Based on the rank obtained by the hopefuls the admission will be granted. The competition is raising every year for the CLAT examination. This year more than 50 thousand aspirants have competed to get admission in National level law colleges. The CLNU Announced the CLAT Result 2018 on 31st may and also the cutoff marks and merit list will be announced along with results. Candidates obtaining the qualifying marks are said to be qualified in the test. How to Check the CLAT Results 2018? Candidates, those who have attempted the exam are advised to go to the official website of the CLAT, clat.ac.in or click on that will be provided below. 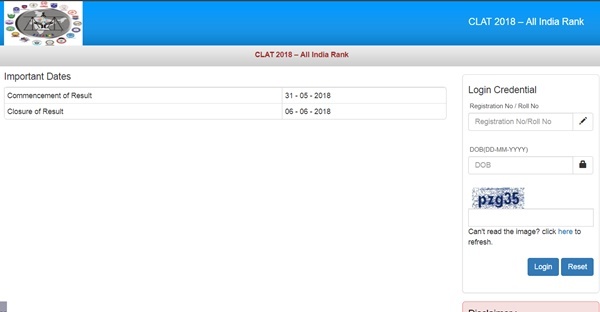 Search for the “CLAT Results 2018 and then click on that available tab. Now, you can give your Exam registration number, date of birth, and other details as necessary and click on submit button. Finally, your result will be displayed on the screen. Candidates can check your result to know whether you are qualified in the exam or not and take a print out of it for your further reference. dear jntu fast updates m tech (jntuk) project notification given .please update in our site..some one help to us..